In Break With Precedent, No Heir Apparent For China's Xi Jinping : The Two-Way Normally at this stage in a Chinese president's tenure, a successor would be obvious. But not for President Xi Jinping. That has led to speculation he might want to hold on to power past 2022. New members of the Politburo Standing Committee (from left) Han Zheng, Wang Huning, Li Zhanshu, Xi Jinping, Li Keqiang, Wang Yang and Zhao Leji stand together at Beijing's Great Hall of the People on Wednesday. There was only one thing missing from the newly anointed leadership lineup announced at the close of China's Communist Party Congress on Wednesday: an obvious successor for President Xi Jinping. Xi, as expected, received another five-year term. But normally at this stage in a Chinese president's tenure, a clear successor has taken the stage in the red-carpet ceremony at Beijing's Great Hall of the People. Instead, the six men standing with Xi are all in their 60s and considered too old to assume the top slot after their terms expire. As NPR's Anthony Kuhn reports from Beijing, the move — or its lack thereof — has "fueled speculation that Xi might break with recent convention, and try to stay in power beyond 2022." The BBC adds: "There had been speculation that Mr. Xi would elevate his protégé Chen Miner and Guangdong party secretary Hu Chunhua, both of whom are in their 50s — young enough to be credible successors." "The make-up of the committee, which has ultimate control over the world's second-largest economy, appeared to be a compromise to include a broad range of voices from party elites. The committee includes one person known to be very close to Xi — Li Zhanshu. Li, who often accompanies Xi on overseas trips, was named the third-ranked member, meaning he will most likely assume the role of head of the largely rubber-stamp parliament. That will not be confirmed until parliament meets in March." As NPR's Bill Chappell reported on Tuesday, the 64-year-old Xi will turn 68 while in office, "putting him outside of China's norm of not allowing leaders who are older than 67 to hold power." 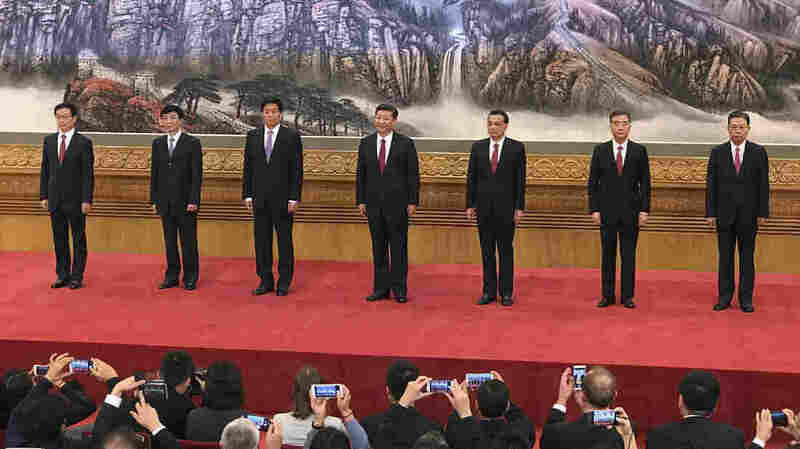 Anthony reports: "Xi introduced the seven most powerful men in China, including himself. He said China would continue the policy of economic reform and opening to the outside world, which it began nearly 40 years ago." "It is my conviction that the Great Rejuvenation of the Chinese Nation will become a reality, in the course of reform and opening up," Xi said in an address. Xi has already become arguably the most powerful Communist Party leader since Mao Zedong, the founder of modern China. On Tuesday, a section was added to China's constitution to include "Xi Jinping Thought on Socialism with Chinese Characteristics for a New Era." The addition of "Xi Jinping Thought" is unprecedented since "Mao Zedong Thought" was officially incorporated into the document (although there was "Deng Xiaoping Theory").